Ananka's Diary: Are You Thinking? Remember, all entries in the 1000 Contest are due no later than midnight on Friday! Hi Kristen! We've just arrived in NYC for the weekend and we were wondering if you had any super-awesome-funky-secret-local recommendations on where to go. Any tips? Sent you one, but about to send the other!!!!!! 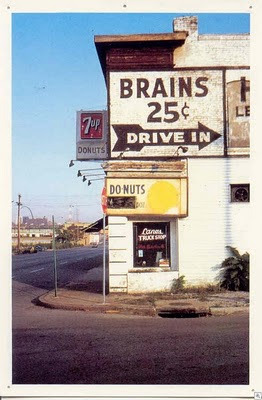 Brains and Doughnuts. Even zombies eat fast food. omg new york is getting so much snow!!! this is the most snow days i have ever had!! Yeah, NY is getting FEET OF SNOW for once. I like the snow, and the cold, but snow days? Not me. I'm homeschooled. But I like it that way. Last weekend, I went to the movies with my friends, afterwards there was a guy and his friends driving a van around yelling "free candy!!!" out the door. Me and my friends-being ninjas like that-weirded them out so much that they drove away, and didn't come back! K. yelled "Got any Twix?" L. yelled "What do you think we are, STUPID?!?!?!" ME, I yelled "Welcome to Canada!!" I just sent mine in! I hope I sent it to the correct address, oh, and my scanner was stupid so there is an inch of blank white on all... and i am not good/creative at coloring so u am making it up to you to choose the colors if i win! sorry i am so lazy! Sorry, didn't read about the contest till 15 mins past midnight?!? Arrrgh! Maybe next tme! Note to all of you antaganists: don't wait till the last min. you will be sorry every time! ive been sitting here staring at the computer for the past hour. HELP ME!!!!!!!!!!!!!!! ITS 9:07 WHERE R THE FINALISTS?!?!?!? I like design #3. Mystery is greatly captured in tis design and I appreciate craetivity of it's designer.